Soon, the police wont have to draw their guns. They will be able to just push buttons and move joysticks to capture the bad guys. We might not be ready for Robocop, who was able to single-handedly deal with much of the violent crime in Detroit, causing the rest of the police force to become worried they may be replaced, but today’s police Robots are designed to deal with situations that are difficult to get to or dangerous for first responders. These robots can manipulate objects as well as gather data through a variety of technologies. One area that presents real and immediate danger to police officers is a bomb threat. One wrong move would bring certain death to the officer and anyone close by. To prevent this from happening, a robot would substitute for an officer in locating and defusing a bomb, using cameras, sensors and microphones. A professional bomb disposer would control a robot from a safe distance avoiding human casualties. During the disposal process if a mistake is made, no one would be injured. With this method, several bomb experts could be utilized, lessening the possibility of an error. These robotic controls are modeled after video game controllers, reducing the amount of training needed to operate the robot. The role of the bomb disposal operator is to accomplish the task as far away from the bomb as possible. A human, using his hands to handle a bomb, is only used in extremely life-threatening situations, where the hazards to people and critical structures cannot be reduced. 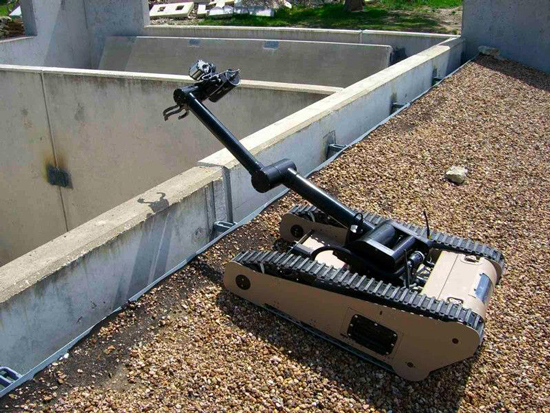 Outfitted with cameras, microphones, and sensors for chemical, biological, or nuclear agents, a bomb disposal robot can help the bomb disposer get an idea of what type of bomb they are dealing with. Many of these robots have hand-like manipulators in case a door needs to be opened, or a bomb requires handling or moving. In the picture below, a 50-pound robot, Fido, sniffs out bombs. Manufactured by iRobot, Fido, which has a seven-foot arm, can drive to and reach through windows, under vehicles and around objects and locate ultra-sensitive explosive detectors close to suspicious items. Police search and rescue robots (SAR) are being used in rescue situations, such as damaged buildings after a disaster that are unsafe for a first responder to enter and in attempts to find and rescue victims. It’s only been recently that robots have been developed for search and rescue, as GPS and thermal imaging was added to the arsenal available to robots. There are many scenarios where a police officer or civilian is wounded by the bad guys, but can’t be removed from the scene because of an on-going firefight. The SAR would step up and make the rescue, using its own bulk to protect the person being rescued. The most important function of a SAR robot is to relay back information to the rescuers, from the exploration of the area while locating survivors. 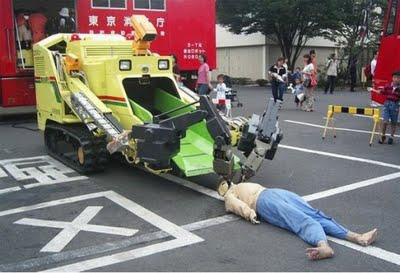 The SAR robot has to be able to reach the survivors by digging through the rubble. Upon reaching survivors, some SAR robots are capable of providing aid, removing obstacles, and rescuing the survivor. In a disaster, a survivor might be trapped and immobilized. Attracted by the CO2 in a survivor’s breath and the heat from the person’s body, a robotic snake wriggles towards the victim through gaps too small and dangerous for humans. The survivor’s location is transmitted to the first responders who, knowing that the person is alive, begin to dig their way through the rubble. The police are often involved in hostage situations. Using a robot, the police can see how many hostages are involved, where they are located, along with their physical condition. The police can also talk with the hostages or their captor by way of audio equipment. Should food or medical supplies be needed, it would be safer for a robot to deliver what is requested. Should the police need to breach doors, the BOZ 1 comes in handy. Originally designed for car bomb applications, the powerful BOZ Hydraulic Jaw can be used to tear, pry, crush, drag, and lift to complete its EOD, HAZMAT, and Search & Rescue Missions. 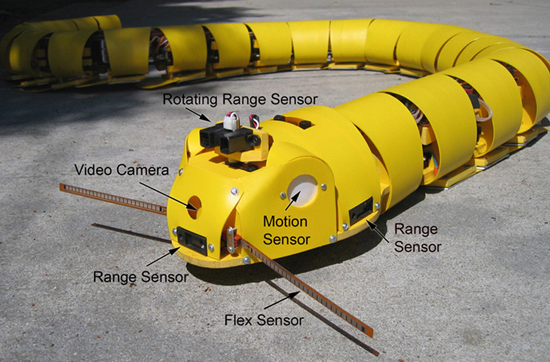 Another robot used for breaching is the MATILDA, a low-cost reconnaissance robot which is built by Mesa Associates. It weighs 40 pounds and measures 26 inches long x 20 inches wide x 12 inches high (platform only). It has optional attachments, such as a manipulator arm, and a detachable breaching mechanism that allows explosive charges to be attached to a door or wall. Matilda can climb stairs up to a 50° incline, and contains a pan & tilt driving camera assembly in color and B&W with a fixed B&W rear camera. 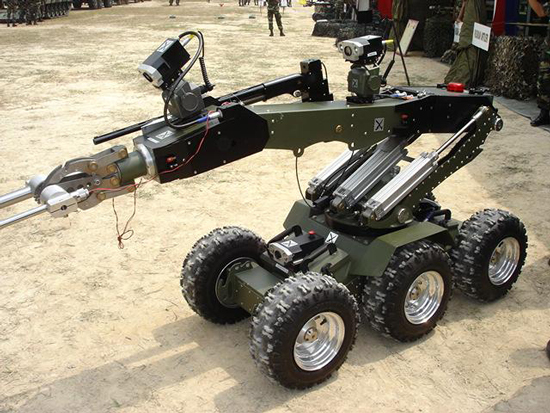 It has many operational accessories, such as a manipulator arm with Zoom Camera; PAN recoilless, RE 12-12 or Proparms 20 mm disrupters; mount for sensors, lights, cameras, tactical tools, and non-lethal weapons; and 984 feet of fiber-optic control. It also has an optional cart that Matilda can use to carry up to 500 pounds of equipment for the police team, or food for hostages. The best feature is that Matilda only weighs 25 pounds. It has rechargeable batteries, which can last 6- 10 hours. When a police team needs to see before they advance, the Recon Robotics Scout® IR is the choice. It’s the world’s first throwable, mobile reconnaissance robot with the capability of seeing in complete darkness. The Recon Scout IR saves lives by allowing the police to gain inside knowledge about a dangerous and hostile environment before sending in the swat team. An officer can throw the Recon Scout IR through a window or doorway, and use the handheld Operator Control Unit (OCU) to move the robot through a dark environment. The infrared optical system on the robot automatically turns on when the ambient light is low, and immediately begins transmitting clear real-time video to the OCU video screen or a nearby command post. 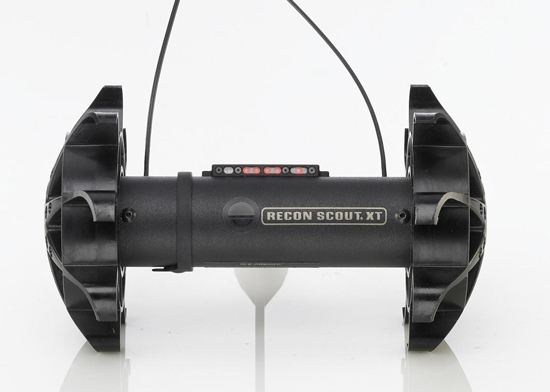 The Recon Scout is cylindrical, 2 inches in diameter and 5 inches long. It can roll up 20° slopes, and hop over four inch obstacles by winding and releasing a leaf-spring tail. The Scout sensor suite, depending on applications, may include a video camera, microphone, vibration sensor, gas sensor, as well as other sensors. It has a short-range analog RF link, and can be launched through windows, The Scout fits snugly inside a protective covering called a Sabot that absorbs much of the impact during the launch. In the race to rule the air with police drones, one new device called the Crazyflie Nano Quadcopter (watch this video) has the potential to help jump-start the era of small drones at the micro scale. The tiny open source quadcopter flies with the speed and agility of an insect. The quadcopter can be operated with a PS3 controller and has a video camera that sends images back to a computer. It even allows for wireless charging. A LED lamp can be attached to the robot, giving the quadcopter a remote search light. The quadcopter has a short flying time of seven minutes. Soon, the police won’t have to draw their guns. They will be able to just push buttons and move joysticks to capture the bad guys.